This is a portrait of a philosopher, who watched three TV's at once, while surfing the net and maybe listening to his iPod and reading a book. He would cheerfully become posthuman if he could get hooked up to the system like this. This is an older painting; I'm sure his technical hook-ups would be more elegant now. 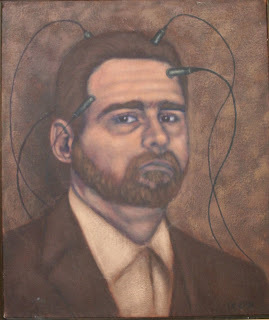 I am submitting this painting for this week's Illustration Friday topic of electricity. So what's this thing with husbands and things electrical?! Mine also has a beard; is there a link? I don't know, Connie, but remember Tim the "Tool Man" Taylor on Home Improvement? Maybe it's like that, except with technology. My husband is an information junkie. lol i know someone almost post human as him! lol.. reading a book, listening to music, tv on, surfing, watching a dvd, downloading torrents, chatting with me, cooking, and the washing machine on. ha! men can be like women but admit it, we still manage better.. hehe..
i'm kinda like that too lol wonderfully done, lynette!